Does Countering Prevent Cast Effects? definitely change the format of this from "legacy" to "casual". you don't have nearly enough sources of mana to cast your big spells. a deck with cmc 4 cards needs 24 lands, and a deck with cmc 5+ cards needs 24 lands plus mana ramp. with 21 lands, only about 1/3 of your draws will be lands. that means if you want 10 mana for Desolation Twin , you're gonna need to be about 30 cards deep in your deck, putting you at turn 23 at least. 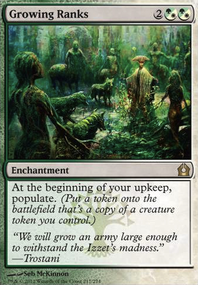 fetchlands like Misty Rainforest , shocklands like Breeding Pool , and checklands like Hinterland Harbor go a long way toward ensuring you have the colored mana you need. instead of running 1 or 2 of so much stuff, pick the best ones and run 4. this will drastically improve consistency. @[email protected]_only Glad that you like it. You COULD include All Is Dust is your sideboard, but seeing that you have around ANNIHILATOR 50, I don't think that is is necessary. And While World Breaker , Oblivion Sower and Sire of Stagnation are all powerful cards, they don't have the pure smashing power of Desolation Twin or Void Winnower and that is what im really looking for in my sideboard. I also don't need to include Sire of Stagnation because I have Kozilek, Butcher of Truth who automatically refill my hand regardless of how many cards I had in there prior. While I looked at Ulamog, the Ceaseless Hunger , Ulamog, the Infinite Gyre has more potential for any possible doomsday devices. Shuffling my graveyard into my library is just an added security feature(just in case. You'll never know what you'll com across). He also has Annihilator which is always a plus. Hey, fellow 'Laddie brewer! Stopping by to suggest some ideas to your deck. Trading Post in for Whirlermaker : 4 mana and tap to make a dude is too expensive. A better option is to put in good ol' Trading Post as it makes a 0/1 goat for 1 mana and 1 life. 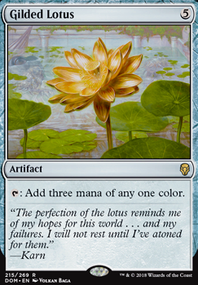 Remember that life is a resource too, and at 40 in EDH, 1 life won't make that much of a difference. Besides, Trading Post does it all! Draws a card, recurs artifacts, creates tokens, and gains life. Excellent piece for any artifact deck. 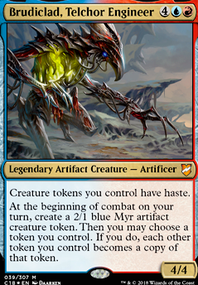 Cyclonic Rift for Aether Gale : This is the first big money upgrade I'm suggesting. I understand if you want to maintain a budget, but consider splurging on a CyRift if you see the chance to trade for one or come across some extra dineros. It bounces EVERYTHING except for your big bad bois, so you can swing out and win. Chaos Warp : Izzet suffers from the ability to remove enchantments or exiling in general (other than very few spells like Lava Coil or Curse of the Swine , two cards you also may want to consider as removal), so having a card that can hit anything is imperative. Chaos Warp at $2ish does just that. At instant speed! Oh, I'm about to get swung at with an unblockable Blightsteel Colossus ? Nope that noise. They've got Propaganda or Sphere of Safety ? Tuck it away! Thus, your chances to win increase even more. Like your number of tokens. Twinflame : Cheap copy maker, and you can make even more copies of more things, but only one is enough for Laddie to create an army. It's a bulk-ish card so it shouldn't hurt the budget. 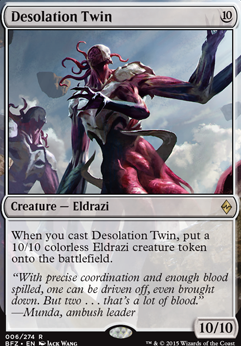 Desolation Twin : Another bulk card that makes a token on entry?? Excuse me?? Yup. Gives you a free 10/10 token on arrival that Brudiclad would like to use as a template. No annihilator, though, but an army of 10/10s is NOTHING to laugh at. Dance of Many : Old, cheap enchantment (costs UU to play) that makes a copy of ANYTHING on the board. Has a UU maintenance cost at the upkeep, but it doesn't matter if you already made other copies and swung with them all. I invite you to look at (my build)[http://tappedout.net/mtg-decks/brudiclad-the-big-bad-boi-builder/] and compare lists for ideas. Again, I didn't suggest many changes because I don't want to take away from the deck; it should still be yours. Lemme know what you think of these changes! You want to not have to rely on cards like Planar Bridge to make the deck playable. Also means you can play Endless One , Desolation Twin , Artisan of Kozilek and Conduit of Ruin . Also, Deceiver of Form is fun. 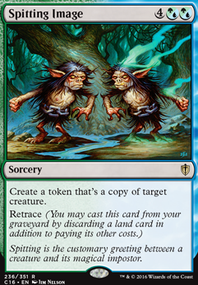 Also if you're looking for some bigger tokens, Desolation Twin can be pretty sweet together with token doublers. Take out the "Curses" for four more lands like Smoldering Marsh , Tainted Peak , Rakdos Guildgate , and Canyon Slough . All these lands are cheap and would normally go in a PreCon. Take out Cavalcade of Calamity since you only have 3 creatures with power 1 or less for either a Rakdos Cluestone , Rakdos Keyrune , or Rakdos Locket . 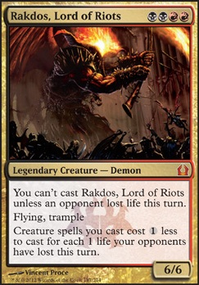 Take out Rakdos's Return , sure it is a good mana sink but I feel either one of the mana rocks from above would be better placed, or maybe even Showstopper to finish the game out when a board wipe happens. 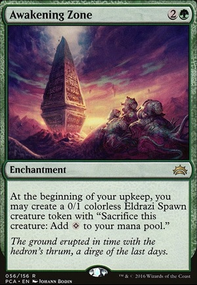 Have no clue to what you could take out for one of these bad boys, but I would suggest adding in something that could end the game like Artisan of Kozilek , Colossus of Akros , Void Winnower , Desolation Twin , or Ancient Stone Idol . All of these may not be Rakdos theme, but they are great ways to end a game through damage. They could be the "Center Pieces" of the show.